The Market. You hear the term being used on the evening financial news. It is mentioned in the daily newspapers. Your parents may even talk about it. But do you know what it really means? Without getting into a precise definition, the phrase "the market" usually refers to the stock market. When people ask about the condition of the market, they are asking whether prices of stocks are generally increasing or decreasing. Knowing that the market exists is one thing, but knowing how to measure the health of the market is another thing. In the U.S. economy, experts have come up with ways to measure the market. In this section, we will discuss the marketplace where stocks are bought and sold, and the various indices or measures that are used by investors to tell how well the market is doing. 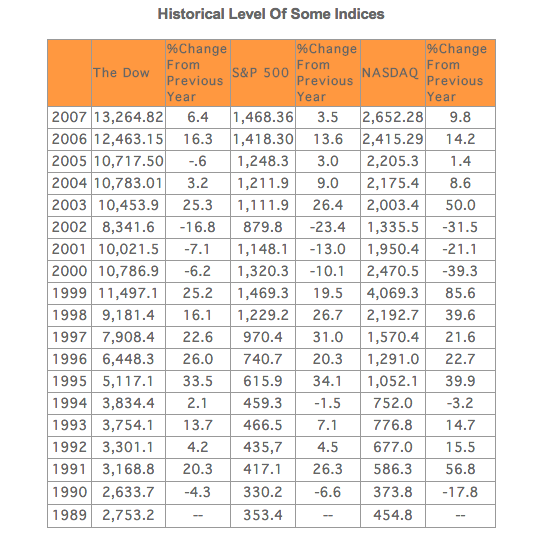 Click here to see the historical level of some indices. Stocks are bought and sold through exchanges - institutions such as the New York Stock Exchange (NYSE Euronext), the American Stock Exchange (AMEX), and the National Association of Securities Dealers Automated Quotation System (NASDAQ) through which stockbrokers trade (in other words, buy and sell) stock. Each of these exchanges has its own rules and regulations that govern which companies can be listed on the exchange. Launched in 1817, the New York Stock Exchange lists some of the biggest companies in the country. The American Stock Exchange, which was launched in 1842, is commonly viewed as the younger sibling of the New York Stock Exchange. NASDAQ was started in 1971 as the exchange for smaller companies, but it has grown to include such big companies as Microsoft, Intel, and MCI. You don't have to know whether a stock is traded on the NYSE, AMEX, or NASDAQ when you buy or sell stock. Your stockbroker or your online broker will simply buy the shares for you - they are the ones who have to know where to go to acquire the shares. At the end of each day, these exchanges record what is known as closing prices for each stock. Closing prices are generally the last price during the day at which the stock was bought or sold. The closing prices in these exchanges are what are often used to tell if the stock market is doing well or not. The following are the three important stock market indicators or indexes most stock experts use to tell how stocks are doing: The Dow Jones Industrial Average (The DJIA or The Dow), The Standard & Poor's 500 (The S&P 500), and the NASDAQ Composite Index (The NASDAQ Composite). The most prominent stock market indicator in the United States is The Dow. Charles Henry Dow first published the Dow on May 26, 1896. At that time, it included the sum of the prices of just 12 so-called "smoke stack" companies, such as coal and gas companies. Today, The Dow is made up of 30 stocks of some of the biggest companies in America. The table in the index calculation section shows the companies that are included in the DJIA. The stocks for the Dow are pulled primarily from the New York Stock Exchange. Of the original 12 stocks included in The Dow, General Electric is the only company still on the list. The index is calculated by summing up the "adjusted prices" of the stocks of the companies listed on the table. The adjusted prices are the stock price for each company, adjusted for things such as stock splits (further explained in this website). You won't be able to calculate The Dow on your own by averaging all the closing prices of the 30 stocks that make up The Dow, without knowing how to adjust the price of each stock. The adjustment factor is called The Divisor. See the section on index data on the components of The Dow and how the index is calculated. The tables below show the companies in The Dow. On December 31, 2007, the Dow was at 13,264.82 points -- a 6.4% increase from its level at the end of 2006. When you hear on the evening news or read in your local newspaper that The Dow went up 20 points, you can think of it as meaning that the average of the stock prices in The Dow went up by $20. Sometimes the change in The Dow is given in percentage terms such as "The Dow was up 15% yesterday." As long as you know in what terms the change is expressed--whether in points or in percentage--you can gauge the seriousness of the change in The Dow. Many investors focus on the day-to-day changes in The Dow. As a Teenvestor, you shouldn't be concerned with daily changes because you are a long-term investor. You are in stocks for the long haul--four, five, seven years and beyond. As long as you've done your research on a company, and feel good about its long-term prospects, declines or increases in The Dow should not get you overly excited. The DJIA has been criticized because it measures how big companies are doing and because it does not include some of the types of businesses that now play a role in the economic life of the country. For example, an Internet company like Ebay is currently not on The Dow. What this means is that The Dow does not look much like the portfolio of stocks held by many small investors--especially those investors who like high technology growth stocks. Another gauge investors use to tell how the market is doing is the Standard & Poor's 500. As the name suggests, there are 500 stocks in this index. The stocks in this index are too numerous to list here but it includes many of the stocks found in The Dow, and many more stocks--at least 470 more stocks. The stocks in the S&P 500 Index are traded on the NYSE, the AMEX and the NASDAQ exchanges. Since the S&P 500 has more stocks in it and covers many more types of businesses than The Dow, it is considered a better measure of how the stock market is doing. Like The Dow, the change in the S&P 500 is at times given in terms of points (dollar amounts) and at times in terms of percentage. On December 31, 2007, the S&P 500 was at 1,468.36 points -- a 3.5% increase from its level at the end of 2006. The NASDAQ Composite Index (The NASDAQ) is made up of the thousands of stocks traded on the NASDAQ exchange. Recall that in an earlier section we told you that the NASDAQ Exchange is generally where the stocks of smaller, lesser-known companies are traded. For this reason, the NASDAQ Composite Index is used to tell how smaller companies are doing. Of late, The NASDAQ has been doing well because of small high-technology companies that have had huge run-ups in stock prices. Like The Dow, the change in the NASDAQ Composite Index is given in terms of points (dollar amounts) and in terms of percentage. On December 31, 2007, the Nasdaq at 2,652 points -- a 9.8% increase from its level at the end of 2006. As you can imagine, there is a relationship between The Dow, The S&P 500, and the NASDAQ Composite since they are all supposed to give an indication of what is happening in the stock market. In general, when one moves up, the others move up as well. The point increase or percentage increase may be different, however, because of the types of stocks included in the various indexes. Because The Dow includes the stocks of the biggest companies in the country, it tends not to move up or down as much as The S&P 500 and the NASDAQ Composite. Just think of The Dow as a big ship that is hard to slow down or speed up. Even though, in general, the three indexes move up and down together, there are times when the NASDAQ Composite is out of step with The Dow and The S&P 500. This happened quite frequently in 1999 and 2000. The reason was that technology stocks were primarily what determined the NASDAQ Composite. These stocks were red hot at that time, regardless of what was happening to the rest of the stocks in the stock market.